Precision UK’s CPX degreased copper tube is manufactured in the UK under BS EN 13485 Medical Devices: Quality Management Systems. All tube is manufactured under strict quality control procedures to ISO 9001:2008. CPX tube is the only British manufactured tube that is CE marked as a class IIa Medical Device 93/42/EEC with notified body British Standards Institute under CE0086. It is suitable for jointing degreased medical gas copper fittings and other medical gas equipment compliant to BS EN 13348, BS EN 1057, BS 2871 Part 1 Table X, EN 7396 and HTM 02-01. 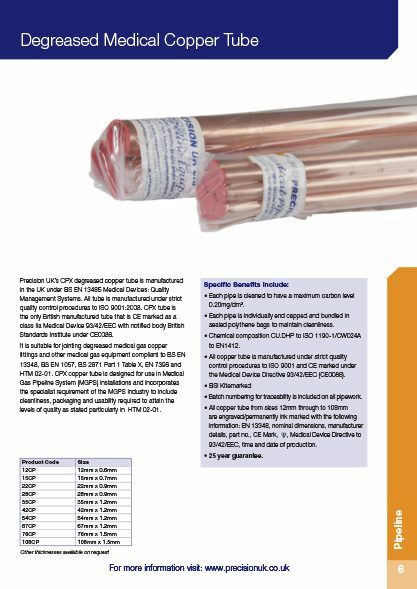 CPX copper tube is designed for use in Medical Gas Pipeline System (MGPS) installations and incorporates the specialist requirement of the MGPS industry to include cleanliness, packaging and usability required to attain the levels of quality as stated particularly in HTM 02-01. Each pipe is individually end capped and bundled in sealed polythene bags to maintain cleanliness. Chemical composition CU.DHP to ISO 1190-1/CW024A to EN1412. 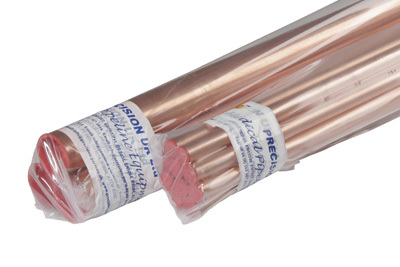 All copper tube is manufactured under strict quality control procedures to ISO 9001 and CE marked under the Medical Device Directive 93/42/EEC (CE0086) Class IIa. Batch numbering for traceability is included on all pipework. All copper tube from sizes 12mm through to 108mm are engraved/permanently ink marked with the following information: EN 13348, nominal dimensions, manufacturer details, part no., CE Mark, Medical Device Directive to 93/42/EEC, time and date of production.